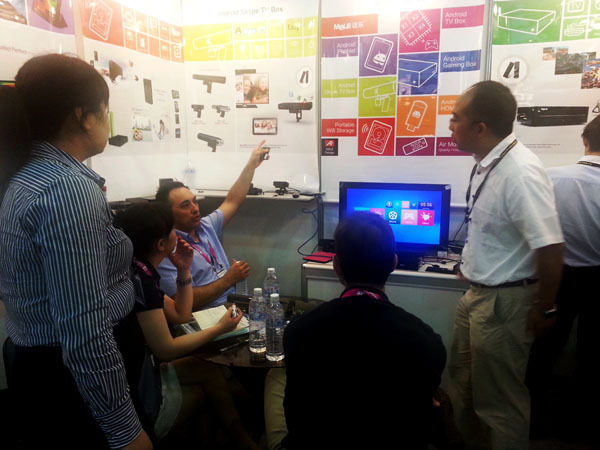 The 33rd Taipei International Computer Exhibition (COMPUTEX TAIPEI 2013) is held in Taipei from June 4-8th. This exhibition attracted professionals and buyers from all over the world. Shenzhen Mele Digital Technology Ltd. with a variety of new products has attracted attention from global buyers. In addition to the traditional Internet HD multimedia player and Hybrid TV Box products, Mele Digital launched more intelligent household digital products in this exhibition. With continuous investment on product technology, Mele Digital continue to improve and introduce new Dual-core & Quad-core products: Android Gaming box, Android Skype TV Box, Android 3G Phablet and air mouse with mic and headset that support G-sensor games. These Products with its unique and humanized design, has attracted many buyers request demonstration and discuss business cooperation. With the rapid growth of living room intelligent products, consumers are getting more and more choices when selecting new consumer products. As one of the world’s leading Internet HD multimedia terminals and systems solution provider, Shenzhen Mele Digital Technology Ltd., rely on forward-looking market research, competitive strategy of differentiation, high quality efficient development advantages, expanding and strict quality management system, product sales in more than 40 countries and regions around the world! Mele Digital will continue to lead the living room electronic products toward intelligent & diversified, and create a multimedia center for each family.